This article will review how to give an intramuscular (IM) injection in the deltoid muscle using the z-track technique. Before administering any type of medication whether it is an IM injection or oral medication, always review your facilities protocols on how they require you to administer that specific medication. In addition, you will want to make sure you have the right equipment. For an intramuscular injection, you will need a syringe (many vaccines are pre-filled already), needle (pick the right gauge and needle length), alcohol prep, gauze, tape, or a Band-Aid. Intramuscular injections in the deltoid muscle will require a needle length of at least 1-1 ½ inches for adults. Most commonly a 1 inch needle length will be used in adults for an IM injection in the deltoid. However, this is where you will need to think critically. Look at the patient and if the patient has a lot of adipose/fatty tissue over the deltoid muscle a 1 1/2 inch needle length may be best. 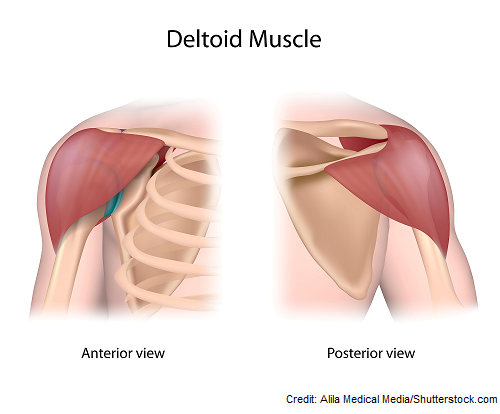 Remember the deltoid in an adult can hold no more than about 2 milliliters of a solution. Hence, this is a great site for the flu, hepatitis B, and pneumonia vaccines in an adult. If a higher amount of solution is needed, the solution is thick, or the solution is known to cause irritation, use another muscle like the ventrogluteal. Tip: Ask the patient what arm they prefer for the injection to be administered in because it can sometimes be sore the next day….try to use the non-dominant arm, if not contraindicated. According to CDC.gov: Gloves are not required when administering vaccines unless the person administering the vaccine is likely to come into contact with potentially infectious body fluids or has open lesions on hands (“Pinkbook | Vaccine Administration | Epidemiology of VPDs | CDC”, 2015). Find the injection site by first locating the acromion process. This forms the highest part of the outer shoulder and is a bony area (see picture below). 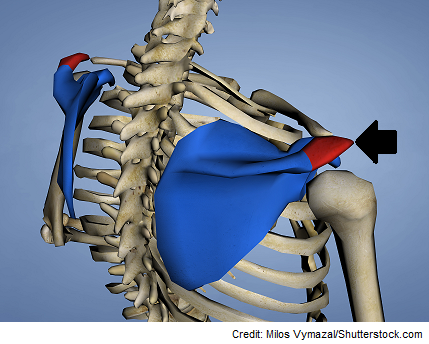 Once you find this area, go about 2 fingers widths below this area, which will be the injection site for the deltoid muscle. Cleanse the site with the alcohol prep by starting in the center and working outward. Then let it completely dry. Use the z-track technique to administer the medication. Don’t pinch or bunch up the skin. 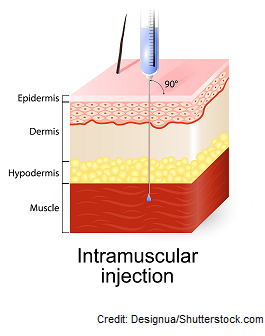 The z-track technique is recommended for IM injections. WHY? This technique decreases pain to the patient, BUT most importantly it prevents the instilled solution from seeping into the subcutaneous tissue. To do this technique, take your non-dominant to the side of the injection site and pull the skin to the side (opposite of the injection site). Once the z-track technique is in place, take your dominant hand and quickly insert the needle at a 90’ angle into the skin. Steady the needle by using the thumb and forefinger of the non-dominant hand. This prevents potential damage to the muscle or surrounding tissues along with accidental displacement of medication. Use the dominant hand to inject the solution at a rate of 10 seconds per mL (don’t inject too fast because this can cause damage). Example: if you’re administering 0.5 mL, instill this solution over 5 seconds. Once the solution is injected completely, wait 10 seconds before removing the needle. Remove the needle at the same angle it was inserted (90’ degrees). Engage the safety of the needle and promptly discard it in the sharps container. Don’t massage the injection site (this could force some of the solution into the subcutaneous tissue). Light pressure can be applied to the site if bleeding occurs. You may place a Band-Aid over the site if needed. Doff gloves if worn, perform hand hygiene, and document (muscle used, time administered, right or left side, amount of medication instilled, and patient’s response). Is aspiration required? According to CDC.gov, aspiration is no longer recommended. CDC.gov states: Aspiration before injection of vaccines or toxoids (i.e., pulling back on the syringe plunger after needle insertion but before injection) is not necessary because no large blood vessels are present at the recommended injection sites, and a process that includes aspiration might be more painful for infants (“ACIP Vaccine Administration Guidelines for Immunization | Recommendations | CDC”, 2018).